As with most second term administrations, several of President Obama’s Cabinet Secretaries will be stepping down and new ones will need to be confirmed by the Senate to replace them. In this case, the most notable person to be stepping down is Secretary of State Hillary Clinton. Even though no official word has come from the White House of those being considered for her replacement, Senator John Kerry and current Ambassador to the United Nations Susan Rice are being floated. However, both Senators John McCain and Lindsey Graham are expressing outrage at the prospect of Susan Rice being nominated and have vowed to do all that they can to prevent this from happening. There is speculation that the reason they don’t want Ambassador Rice nominated is that they would prefer John Kerry, thus opening up his Senate seat for recently defeated Senator Scott Brown. Plausible, but this rant is over the logic these two Senators are using to justify their “outrage” of the nomination. Both cite Susan Rice as being at the center of the “Benghazi Debacle” that the right-wing and their Fox News propaganda wing have been trying to morph into an “impeachable offense” against the President. They feign outrage and disgust over what she said when she spoke regarding the incident. It was a tragedy, much is still not known, but the “debacle” has been how the Republicans have been using this incident for political purposes and in doing so, creating problems for the diplomatic corps and those in the area trying to help us out. For example, Representative Darryl Issa divulging the confidential names of Libyan supporters in the area to the public and thus placing their lives in jeopardy. September 11, 2012 9:42 p.m. (Benghazi time): Armed men begin their assault on the U.S. Consulate. 9:59 p.m. (17 minutes later): A surveillance drone is directed to fly over the U.S. compound, but is unarmed. 11:00 p.m. (28 minutes later): Panetta and Chairman of the Joint Chiefs of Staff General Martin Dempsey meet with President Obama at the White House where they discuss the unfolding information and how to respond. The meeting had been previously scheduled. The President instructs them to take all necessary steps needed to secure our personnel and insure others are not in danger. This is 1 hour and 18 minutes after the attack began. 11:10 p.m. (10 minutes later): The surveillance drone arrives over the Benghazi facility. 11:30 p.m. (20 minutes later): All surviving U.S. personnel are evacuated from the consulate. U.S. Ambassador Chris Stevens and State Department computer expert Sean Smith were killed in the initial attack. Midnight to 2:00 a.m. (30 minutes later) Panetta and other senior leaders discuss possible options for further violence if it were to break out. Panetta gives verbal orders for Marine anti-terrorist teams from Rota, Spain to prepare to deploy to Tripoli and Benghazi. Panetta also orders special operations force team training in Croatia and an additional special operations force team in the United States to prepare to deploy to a staging base in southern Italy. 1:30 a.m. (30 minutes later, and 2.8 hours after the initial attack): A six-man security team from the U.S. Embassy in Tripoli (404.5 miles away) arrives in Benghazi. 2:39 a.m. to 2:53 a.m. (1 hour 9 minutes later) The National Military Command Center gives formal authorization for the deployment of the two special operations force teams from Croatia and the United States. 5:15 a.m. (2 hours 22 minutes later, and 7 hours 33 minutes after initial attack) Attackers launch assault on a “second” U.S. facility in Benghazi. Two former U.S. Navy SEALs acting as security contractors are killed. They are identified as Tyrone Woods and Glen Doherty. 6:05 a.m. (50 minutes later) A C-17 aircraft in Germany is told to prepare to deploy to Libya to evacuate the consulate personnel. 7:40 a.m. (1 hour 35 minutes later): The first wave of Americans are evacuated to Tripoli via airplane. Later this day at the White House, President Obama commented about the attack using the words “Act of Terror” in context with his statements regarding the Benghazi attacks. September 16, 2012 (5 days after the attack): On request of President Obama and using “talking points” provided her by the CIA on September 15, UN Ambassador Susan Rice makes a statement regarding the Benghazi Attack. The CIA informed her of the theory at the time that the attack was “spontaneous.” She cites that at that time, they had “no evidence” that this was “pre-planned” as the CIA were still gathering information. Note: Libya is a foreign country still rebuilding a government and security forces following the collapse of the Kaddafi government. U.S. military resources are scattered throughout the region and a State Department request for additional funding from Congress was denied by the Republican controlled House. Further, although John McCain and Lindsay Graham say that from an intelligence point of view, Susan Rice should have known better, the fact remains that as UN Ambassador, she is not privy to continuous intelligence briefings on every intelligence operation or investigation. She is provided that information on a “need to know” basis. She spoke according to the talking points provided her by the CIA. 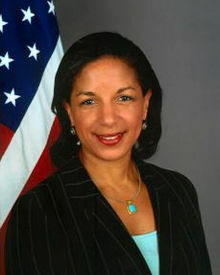 Susan Rice as Ambassador to the UN, is there to represent the interests of the United States to the World Community. She was easily confirmed to that position based on her record in the Clinton White House. She has always served with distinction. She was confirmed for the position by a majority vote in the US Senate to include John McCain and Lindsey Graham. Susan Rice’s current job duties do not include interpreting intelligence data from the CIA. 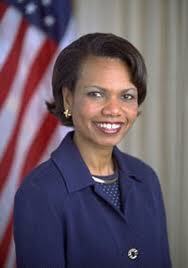 That was the job of another Rice, namely Condoleezza Rice. Now let’s compare the job record of Condi Rice prior to her nomination and confirmation of Secretary of State under George W. Bush. Condi Rice when she first came to the White House was George Bush’s National Security Advisor. She was responsible for interpreting and advising intelligence information for the President and advises him appropriately. In the early months of the Bush administration, there was this group known as Al Qaeda operating in the United States. Various intelligence agencies were concerned regarding traffic going on regarding a potential attack forthcoming. The president gets what’s known as a Presidential Daily Briefing (PDB), giving a summary of issues that the President needs to be aware of. On August 6th, 2001, while the President was vacationing in Crawford, a Presidential Daily Briefing was delivered to Bush. This one was prepared out of frustration over the apparent lack of action from previous PDB’s prepared regarding Al Qaeda for the President and Condi Rice. It was entitled “Bin Laden Determined to Strike in the United States.” Nothing of substance was done until after September 11, 2001 when Bin Laden did strike in New York, Washington DC and Pennsylvania resulting in the murder of over 3000 Americans on American soil. Later, Condi Rice went on the airwaves as National Security Advisor helping the Bush Administration convince the nation that the “intelligence” was a slam dunk, that Iraq was not only involved with Al Qaeda, but were acquiring weapons of mass destruction and were preparing to attack the United States. So with Condi’s help, we attacked a nation that had nothing to do with 9-11, had no weapons of mass destruction, that resulted in the deaths and wounding of thousands of U.S. Military personnel and hundred of thousands of Iraqi citizens. When Condi Rice was nominated for Secretary of State, she was given glowing recommendations from John McCain and Lindsay Graham and was confirmed for the position. They made no reference to her absolute failure to interpret the intelligence (her job duty) and her either being blatantly wrong or was blatantly lying to the American people. The very same thing they are accusing Susan Rice of doing (which she didn’t) that resulted in the deaths of 4 Americans on foreign soil. President Obama called McCain and Graham out on their lies yesterday and they are doubling down. Susan Rice has been effective as UN Ambassador and had nothing to do with Benghazi other than to report out as per the President’s request using data prepared for her by the CIA. In fact, even though things did go wrong in Libya, we need to examine what went wrong and develop plans to make sure it doesn’t happen again. Using the death of 4 murdered Americans for partisan political purposes does dishonor to those who died, their families, the U.S. diplomatic corps, The U.S. Government, the U.S. Senate and the people of the United States. There is “no there there” this was a tragic incident that we must learn from. Now 9-11-01 resulted in over 3000 murders on U.S. soil based on the National Security Advisor not doing her job properly and then lying to the American people in the following months resulting in the additional deaths of hundred of thousands more. Who is more qualified for Secretary of State? One who did her job and no one ever complained about regarding her job performance until just recently or someone who literally has blood on her hands prior to being nominated? John McCain speaks of being responsible for what you say and do. Well, this is the man who not only supported Condi Rice for Secretary of State, he chose Sarah Palin for Vice President. This is the man who cavalierly speaks of bombing Iran. The only proper thing he’s done in recent years was voting to confirm Susan Rice for UN Ambassador. Even a broken clock is right two times a day. To paraphrase Ann Coulter, Our Rice is better than your Rice. As usual, outstanding detective work simplifying a very misunderstood event in a lot of people’s eyes. This points out how the dinosaurs of the Republican party will stoop to new lows using the deaths of four U.S. citizens for partisan gains. Yet another case of the tax payer not getting their moneys worth from an elected public servant.